In this tutorial, you take an extended look at the process of developing a predictive analytics solution. You develop a simple model in Machine Learning Studio. You then deploy the model as an Azure Machine Learning web service. This deployed model can make predictions using new data. This tutorial is part three of a three-part tutorial series. In part one of the tutorial, you created a Machine Learning Studio workspace, uploaded data, and created an experiment. In part two of the tutorial, you trained and evaluated models. Complete part two of the tutorial. 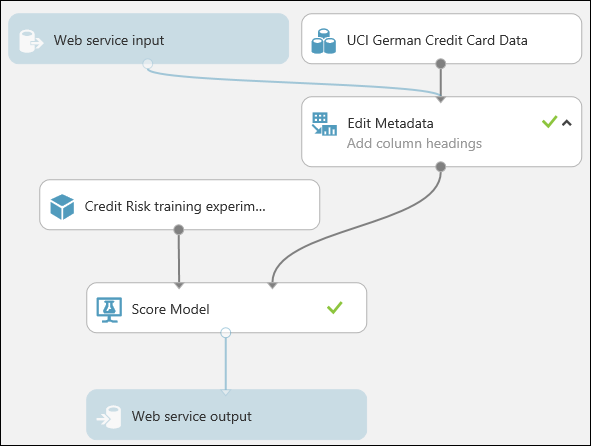 To give others a chance to use the predictive model you've developed in this tutorial, you can deploy it as a web service on Azure. Up to this point you've been experimenting with training our model. But the deployed service is no longer going to do training - it's going to generate new predictions by scoring the user's input based on our model. So we're going to do some preparation to convert this experiment from a training experiment to a predictive experiment. First, you need to trim this experiment down a little. you currently have two different models in the experiment, but you only want to use one model when you deploy this as a web service. Let's say you've decided that the boosted tree model performed better than the SVM model. So the first thing to do is remove the Two-Class Support Vector Machine module and the modules that were used for training it. You may want to make a copy of the experiment first by clicking Save As at the bottom of the experiment canvas. Select each module and press the Delete key, or right-click the module and select Delete. 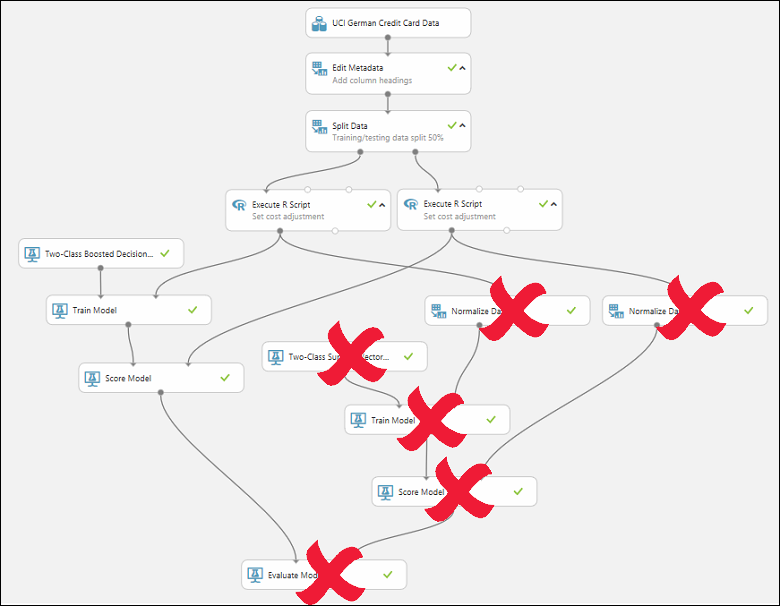 Now we're ready to deploy this model using the Two-Class Boosted Decision Tree. you could do this manually, but fortunately all three steps can be accomplished by clicking Set Up Web Service at the bottom of the experiment canvas (and selecting the Predictive Web Service option). 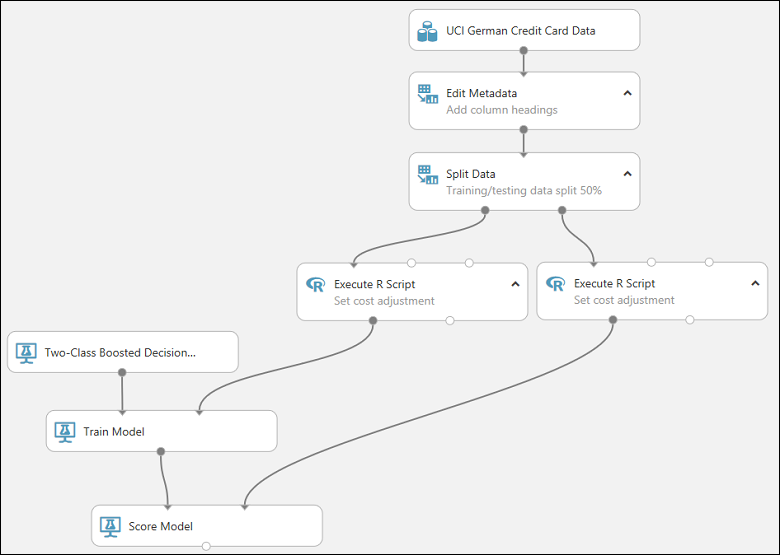 If you want more details on what happens when you convert a training experiment to a predictive experiment, see How to prepare your model for deployment in Azure Machine Learning Studio. You can see that the experiment is saved in two parts under tabs that have been added at the top of the experiment canvas. The original training experiment is under the tab Training experiment, and the newly created predictive experiment is under Predictive experiment. The predictive experiment is the one you'll deploy as a web service. you need to take one additional step with this particular experiment. you added two Execute R Script modules to provide a weighting function to the data. That was just a trick you needed for training and testing, so you can take out those modules in the final model. Machine Learning Studio removed one Execute R Script module when it removed the Split module. Now you can remove the other and connect Metadata Editor directly to Score Model. You may be wondering why you left the UCI German Credit Card Data dataset in the predictive experiment. The service is going to score the user's data, not the original dataset, so why leave the original dataset in the model? It's true that the service doesn't need the original credit card data. But it does need the schema for that data, which includes information such as how many columns there are and which columns are numeric. This schema information is necessary to interpret the user's data. you leave these components connected so that the scoring module has the dataset schema when the service is running. The data isn't used, just the schema. One important thing to note is that if your original dataset contained the label, then the expected schema from the web input will also expect a column with the label! A way around this is to remove the label, and any other data that was in the training dataset, but will not be in the web inputs, before connecting the web input and training dataset into a common module. You can deploy the experiment as either a Classic web service, or as a New web service that's based on Azure Resource Manager. To deploy a Classic web service derived from our experiment, click Deploy Web Service below the canvas and select Deploy Web Service [Classic]. Machine Learning Studio deploys the experiment as a web service and takes you to the dashboard for that web service. From this page, you can return to the experiment (View snapshot or View latest) and run a simple test of the web service (see Test the web service below). There is also information here for creating applications that can access the web service (more on that in the next step of this tutorial). You can configure the service by clicking the CONFIGURATION tab. Here you can modify the service name (it's given the experiment name by default) and give it a description. You can also give more friendly labels for the input and output data. To deploy a New web service you must have sufficient permissions in the subscription to which you are deploying the web service. For more information, see Manage a web service using the Azure Machine Learning Web Services portal. Click Deploy Web Service below the canvas and select Deploy Web Service [New]. 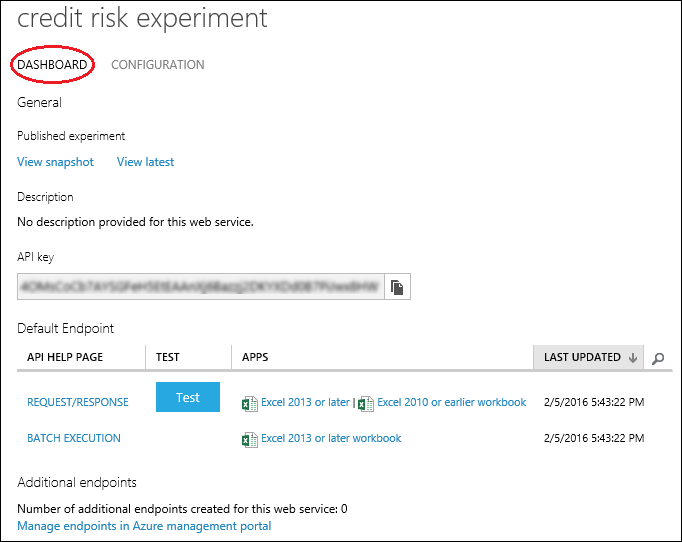 Machine Learning Studio transfers you to the Azure Machine Learning web services Deploy Experiment page. For Price Plan, you can select an existing pricing plan, or select "Create new" and give the new plan a name and select the monthly plan option. The plan tiers default to the plans for your default region and your web service is deployed to that region. After a few minutes, the Quickstart page for your web service opens. You can configure the service by clicking the Configure tab. Here you can modify the service title and give it a description. To test the web service, click the Test tab (see Test the web service below). For information on creating applications that can access the web service, click the Consume tab (the next step in this tutorial will go into more detail). You can update the web service after you've deployed it. For example, if you want to change your model, then you can edit the training experiment, tweak the model parameters, and click Deploy Web Service, selecting Deploy Web Service [Classic] or Deploy Web Service [New]. When you deploy the experiment again, it replaces the web service, now using your updated model. When the web service is accessed, the user's data enters through the Web service input module where it's passed to the Score Model module and scored. The way you've set up the predictive experiment, the model expects data in the same format as the original credit risk dataset. The results are returned to the user from the web service through the Web service output module. The way you have the predictive experiment configured, the entire results from the Score Model module are returned. This includes all the input data plus the credit risk value and the scoring probability. But you can return something different if you want - for example, you could return just the credit risk value. To do this, insert a Select Columns module between Score Model and the Web service output to eliminate columns you don't want the web service to return. You can test a Classic web service either in Machine Learning Studio or in the Azure Machine Learning Web Services portal. You can test a New web service only in the Machine Learning Web Services portal. When testing in the Azure Machine Learning Web Services portal, you can have the portal create sample data that you can use to test the Request-Response service. On the Configure page, select "Yes" for Sample Data Enabled?. When you open the Request-Response tab on the Test page, the portal fills in sample data taken from the original credit risk dataset. You can test a Classic web service in Machine Learning Studio or in the Machine Learning Web Services portal. On the DASHBOARD page for the web service, click the Test button under Default Endpoint. A dialog pops up and asks you for the input data for the service. These are the same columns that appeared in the original credit risk dataset. Enter a set of data and then click OK.
On the DASHBOARD page for the web service, click the Test preview link under Default Endpoint. The test page in the Azure Machine Learning Web Services portal for the web service endpoint opens and asks you for the input data for the service. These are the same columns that appeared in the original credit risk dataset. You can test a New web service only in the Machine Learning Web Services portal. In the Azure Machine Learning Web Services portal, click Test at the top of the page. The Test page opens and you can input data for the service. The input fields displayed correspond to the columns that appeared in the original credit risk dataset. Enter a set of data and then click Test Request-Response. The results of the test are displayed on the right-hand side of the page in the output column. Once you've deployed your web service, whether Classic or New, you can manage it from the Microsoft Azure Machine Learning Web Services portal. 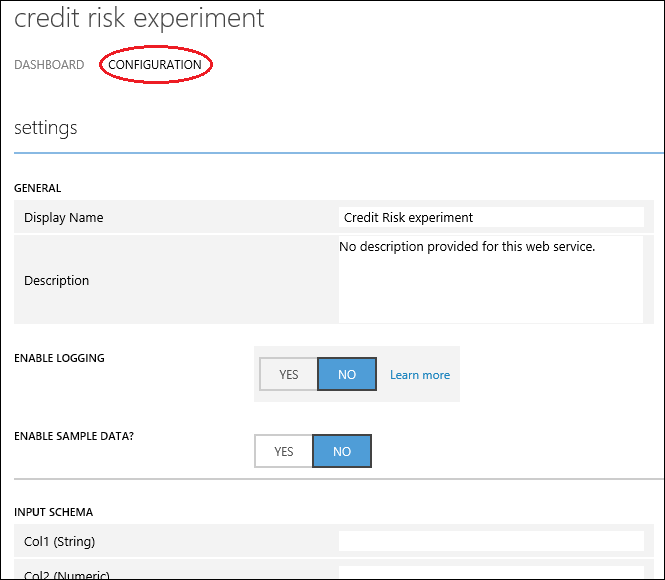 In the previous step in this tutorial, you deployed a web service that uses your credit risk prediction model. Now users are able to send data to it and receive results. Request/Response - The user sends one or more rows of credit data to the service by using an HTTP protocol, and the service responds with one or more sets of results. Batch Execution - The user stores one or more rows of credit data in an Azure blob and then sends the blob location to the service. The service scores all the rows of data in the input blob, stores the results in another blob, and returns the URL of that container. The quickest and easiest way to access a Classic web service is through the Azure ML Request-Response Service Web App or Azure ML Batch Execution Service Web App Template. These web app templates can build a custom web app that knows your web service's input data and what it will return. All you need to do is provide access to your web service and data, and the template does the rest. For more information on using the web app templates, see Consume an Azure Machine Learning Web service with a web app template. You can also develop a custom application to access the web service using starter code provided for you in R, C#, and Python programming languages.